Supergirl #21 - "I'm trying this new approach to problem-solving called 'not punching things in the face.'" 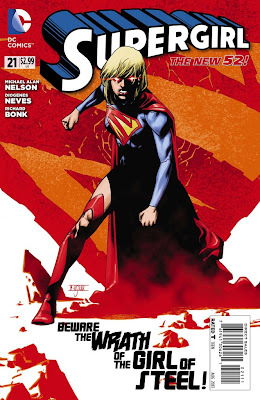 Poor Kara...home planet destroyed...crashed on a planet where everyone's afraid of her and no one trusts her...falls for a guy who turns out to be a creepy super-villain (not that the signs weren't there)...meets her Earth 2 counterpart Power Girl only to have her own ship/home confuse the two and try to kill her for being a "clone"...gets kryptonite poisoning and is literally (albeit slowly) dying! It's no wonder that she's decided that Earth isn't such a hot place to spend whatever's left of her life before the kryptonite catches up to her! So this issue Supergirl steals...well, it's a space-motorcycle essentially, from inexplicable scientist Dr. Veritas and off she goes for greener pastures! Despite the good doctor's insistence that they can cure her if she'll just be patient! When is a teenager EVER patient? What else is going on in the New 52 this week? Find out after the JUMP! Batman and Batgirl #21 - "You've removed your Bat Symbol. Guess it's official." 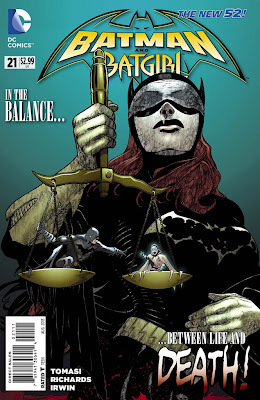 The 5-part "Stages of Grief" storyline continues this month in Batman and Robin as Batgirl shows up for stage 3 "The Bargain"! Batgirl's been going through a lot in her own book and hasn't really spoken to Bruce since everyone decided he was a jerk in "Death of the Family". 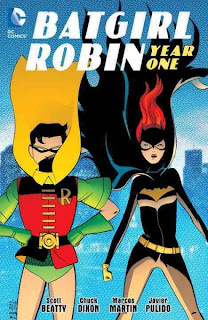 Then of course with the death of Damian "Robin" Wayne and Barbara's mistaken belief that she has killed her brother James Gordon Jr. the wedge of awkwardness has only grown wider. Barbara removing the bat-symbol from her uniform (she believes that since she "killed" her brother that she isn't worthy of it) is a gesture ripe for misinterpretation as well. Sometimes relationships are like that. Wonder Woman #21 - "What I do, I do out of hate. Of you. Of everything." Well, considering the First Born already defeated both Poseidon and Hades, it's going to be a rough go. 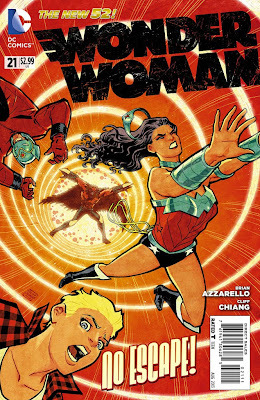 Luckily new god Orion is hanging around Wonder Woman lately...perhaps he can lend a divine intervention? Lots of good character moments in this issue and it looks to be setting up a very different arc going forward...the stakes are getting higher as this really epic tale continues to unfold! 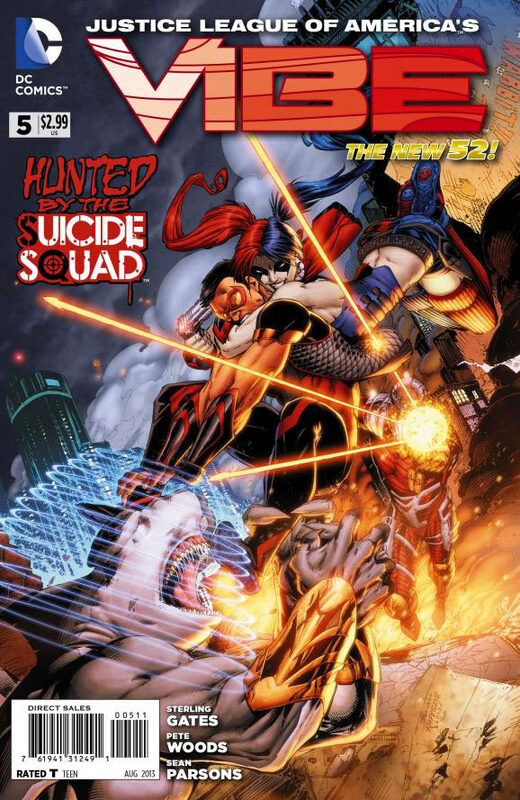 Red Hood and the Outlaws #21 - "Destiny. He actually used that word..."
What better time for Arsenal to visit his therapist? 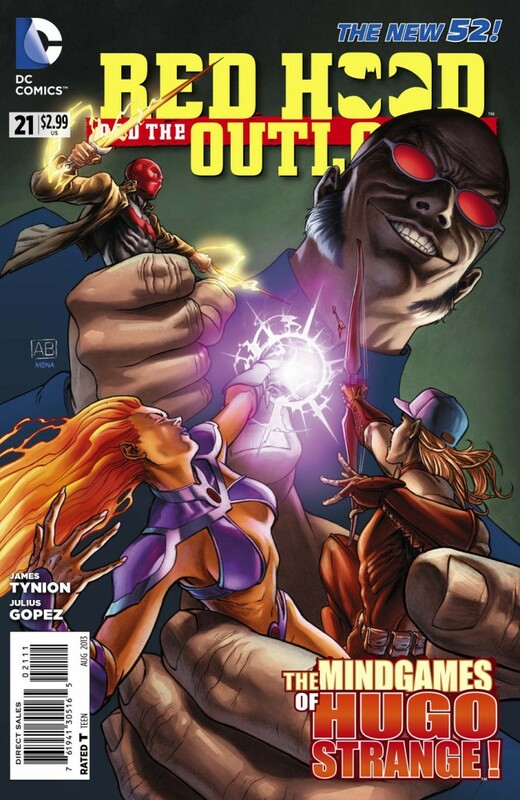 Unfortunately, Roy's therapist is Dr. Hugo Strange! That can't be good! Meanwhile, as Roy is "in session", Essence returns and confronts Starfire about the future. She warns of someone coming..."we're all just pawns in a much larger scheme..."
Oh did I mention that the League of Assassins is after Jason? There's that too...so lots happening! The Outlaws are divided! Will they also be conquered?? Vibe #5 - "I'm just trying to do the right thing here and get you home." Poor Vibe...gets recruited by Amanda Waller to be a big hero as part of the Justice League of America only to be sent on what's supposed to be a milk-run solo mission...point out a shape-shifting dimensional being so that the "men in black" types can take said being into custody. Then he finds out that the dimensional being is a pretty girl who just wants to go home! Obviously, he's going to disobey the scarey government agents and try to help the girl! Unfortunately for Vibe, when you disobey orders from Amanda Waller she gets pissed off...and when she gets pissed off, she sends the Suicide Squad after you! Now Vibe and his new friend (who calls herself Gypsy, incidentally) are fugitives on the run for their lives! All because poor Vibe can't say no to a pretty face with a sad tale...go figure! And that's it for me this week! Oh I'm also half-way through the Batgirl/Robin Year One TPB that came out last week! It's the first time it's been released as a collection and the first time either has been reprinted in AGES. Definintely worth reading! A LOT of interesting titles coming out this Wednesday for New Comic Book day! Teen Titans, The Flash, Justice League, Superman, Catwoman, Talon...the list just keeps on going. Oh and the ALL-NEW Batman/Superman #1 is coming out too! Looks great! Need to read more about SUPERMAN?? I've got some (spoiler-free) thoughts about DC's newest film offering, Man of Steel over at Stryder's Dementia! Take a look! Ok I'm done! Take it easy folks...Peace!